Have you tried every type of spot cream and anti-wrinkle treatment on the market only to find your skin still looks less than its best? Your diet might have something to do with it. Knowing what to put in your body (for example, fruits, vegetables, and plenty of water) is only half the battle. It’s also important to know which foods and ingredients to avoid or minimize if you want good skin. Not sure where to start? Here are 7 things to stop eating now if you want good skin. Too much dairy in your diet can be the cause behind those hard, painful, deep cystic spots that won’t seem to budge from your lower face. When the body has too much of something, it expels that product using any means possible. In this instance, it gets rid of dairy through the skin in the form of acne. Sugar can worsen existing skin conditions such as eczema and is a major culprit in causing skin redness and acne. It’s added to many food items that a lot of people don’t realize. Therefore, read the labels while out shopping and try to avoid anything with added sugar. Natural sources like bananas and pineapples can satisfy a sweet tooth while keeping the sugar content in balance with fiber, vitamins, minerals, and nutrients. Processed foods like microwave meals, fast food, and even common items like chocolate can clog your pores due to the excessive oil your body produces as a result of consuming too much. Moderation is the key here. It’s a good idea to eat clean whenever possible and prepare your own meals. High-glycemic index food includes items like bread, pasta and other starchy grains. These foods not only put weight on your body but can wreak havoc with your hormones and cause your skin to break out. Choose slow carbs like whole grain pasta and brown rice. Fats like margarine can not only clog pores but can also dehydrate the skin. When skin is dehydrated it looks and feels less than fresh and wrinkles easily. Therefore, it’s best to swap margarine where possible or look for margarine-free recipes. 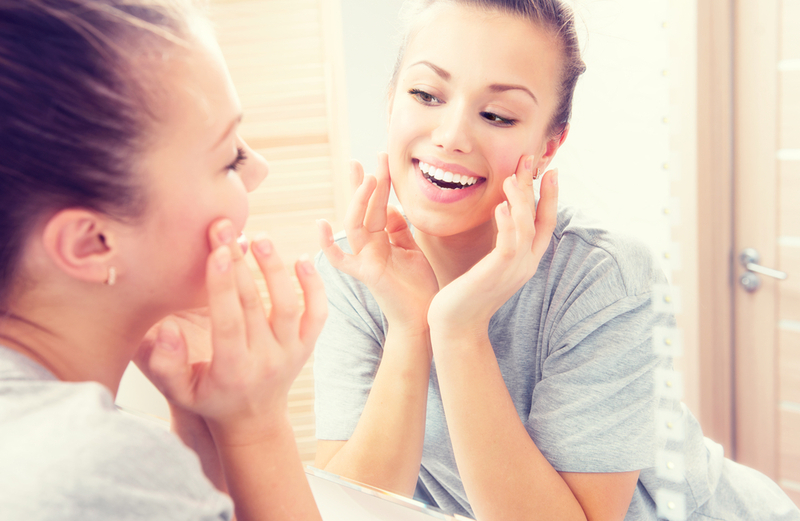 When skin becomes puffy, patchy, or bloated, it could mean that your body is retaining water. Consuming too much salt is a common cause of water retention. Removing that extra sprinkling of salt from your meals is a great way to give your good skin a boost. The iodine in shellfish can cause acne to worsen, so if you already have a face that breaks out once a month, try to avoid too much of this food. It’s worth noting here that the shellfish won’t cause acne in people who rarely break out. Instead, it’s more of a catalyst for those who are already susceptible to spots. When it comes to your health, knowledge is power. Your skin responds to the food and drinks you consume, so it’s important to be mindful about what’s on your plate. Is there a specific food or drink that always causes you to break out? Let us hear about it in the comments below.